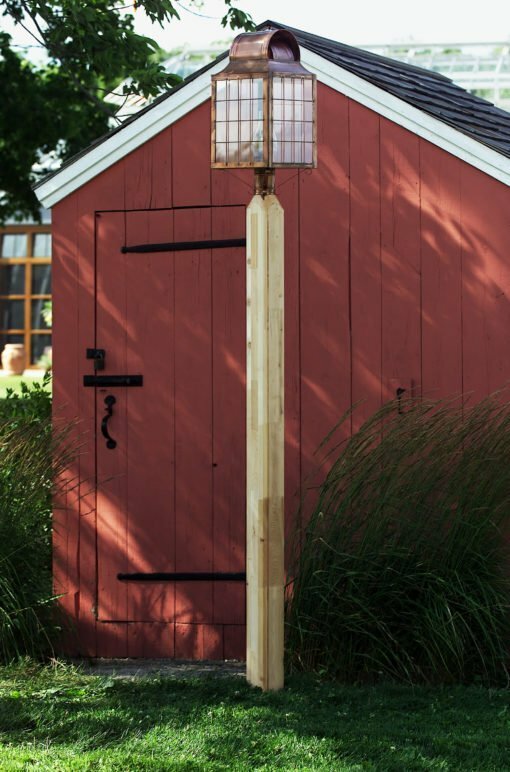 Hammerworks is proud to offer this Wooden Cedar Lamp Post to complement our Colonial Post Lanterns. The simplest pole in our collection of Colonial Style Light Poles this 5 X 5 “Square Pole” features chamfered edges. 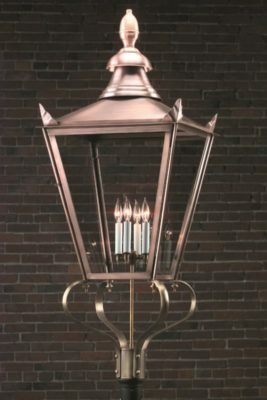 It is a perfect pole to display Colonial Post Lantern P102 or perhaps Cape Cod Copper Post Lanterns Pyramid PP119. For those who prefer a wood pole with more detail take a look at the “Fancy Turned” Wooden Light Post. Either way we endeavor to offer only the highest quality cedar wood poles available. First of all are wooden Colonial Style Light Poles are manufactured from northern white cedar. Secondly it is a laminated product. Therefore it ensures a solid split free pole. In addition your Wooden Colonial Lantern Pole will not warp or twist. Furthermore cedar by nature produces a stable, long lasting pole resistant to rot, decay and insects. Thus they provide strength and beauty, ready to grace the entrance to your home or business for years to come. Especially relevant all our wood poles are made of unfinished white cedar. Therefore you can leave them in their natural state. If you prefer we offer the option of White Stain for an additional charge. Most importantly each lantern post has a center bored wire way which exits out the side of the pole. Also, the 3″ post fitter at the top is compatible with any post light in today’s industry. 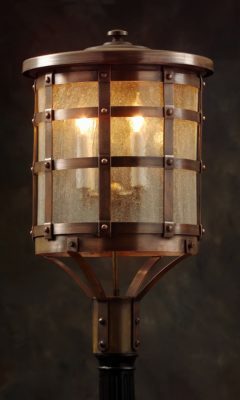 Therefore you can mount a Colonial Copper Post Lanterns Wills P113 or any other post light with ease. In addition the pole measures 8′ 10″. You should plan to bury it about 2-3 feet underground. Consequently this leaves plenty of height above ground to display your Cape Cod Style Post Lantern Garrison P110. 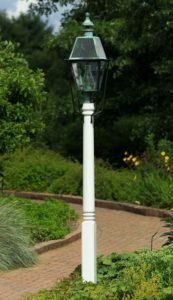 Our classic Aluminum Light Post Ipswich Model is a practical choice for displaying Colonial Boston Post Lantern P103 and any of our other popular Colonial Post Lanterns. Since each Aluminum Light Post varies in size and style you will find a style to meet your needs. Of course each pole has a standard 3″ post fitter to accommodate any post light available in today’s industry. They are also equipped with an “Access Door” at the bottom. Additionally many are available with an optional Ladder Rest. Therefore with Cast Aluminum Lantern Poles Colonial Model or any alternate you can add style and charm to your overall presentation.